Honor your obligation today by paying back your loan and enable NSFAF to continue funding a brighter and educated Namibia. Loan means jointly the approved Tuition Fees and Non-Tuition Fees, additional costs, bank charges, administration charges and disbursements as advanced to or paid on behalf of the Debtor by the Fund, which amount the Debtor is required to pay back to the Fund. In	the	event	that	the	Debtor	has	breached	this	Contract	prior	to	the death of the Debtor, repayment may be demanded from the Debtors’	estate. What are the methods of repayment? How do I provide proof of payment? A proof of payment should be submitted to the NSFAF Recovery Division or e-mail at: recovery@nsfaf.na and you will be issued with your updated debtor’s account statement. How do I pay my loan from abroad? If	the	beneficiary	resides	abroad,	he/she	can	pay	by	Electronic	Funds	Transfer	(EFT)	directly	into	the	NSFAF	Bank	Account	and	email	proof	of payments to the respective consultant dealing with his or her account	or	at:	recovery@nsfaf.na. Do students have to pay the money back after completing their studies? Yes, if it was a loan. For the Income Contingent Loan, the repayments start when the individual is employed. 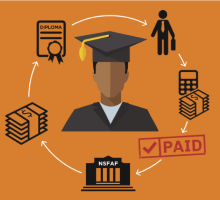 By paying back your NSFAF study loan, you are assisting someone else who needs it just as much as you did. When am I expected to repay my student loan? The time required to start repaying is within six months of completing studies. If a student cannot find employment, it is possible to postpone repayment; in such a case, the request for postponement of repayment must be made to the Board of NSFAF in writing. What is the process of paying back a loan? Any change in contact details, employment status and details of his/ her employer. How often do you send Loan statement? Statements are send via emails once each month. If the beneficiary resides abroad, he/she can pay by Electronic Funds Transfer into NSFAF Recovery Account and email proof of payments to the respective consultant dealing with his or her account. The loan is charged a compounded interest. Therefore when one defaults they suﬀer a compound interest charged on the account. Can you clear in one installment? Yes, One can make the loan settlement at an installment procedure. Does NSFAF charge ledger fees? There are no ledger fees charged on all NSFAF student loans. Can I repay my loan in one instalment? Yes,	one	can	repay	the	loan	in	one	installment. A	Loan	Redeemed	Certificate	will	be	issued	to	the	debtor. What happens after clearing my loan? Once	the	loan	is	fully	settled,	you	will	be	issued	with	the	Loan	Redeemed	Certificate	of	Loan	Clearance. How do you determine the monthly deduction rate? Unless	the	parties	sign	an	addendum	to	the	contrary,	the	amount	of	the	instalments	per	month	shall	be	equal	to	15%	of	the	Debtors	annual	earnings	(gross	salary	less	income	tax	and	pension	fund	contributions),	provided	that	the	maximum	period	for	repayment	may	not	exceed	3	times	the	period	over	which	the	loan	was	received	by the Debtor. What happens if I do not pay back my loan? If	a	debtor	fails	to	make	payment	as	provided	for	in	the	Act	(no.7	of	2014)	and	signed	contract,	his	or	her	name	will	be	placed	by	the	Board	on	a	list	of	defaulting	debtors. Nothing	prevents	the	Board	from	instituting legal action in a court with jurisdiction within Namibia, against a student to recover the amount due to the Fund in terms of a loan. How do I get more information on my repayment options? You	can	contact	our	recovery	division	on	061	420	647	or	email	recovery@nsfaf.na	for	further	details. What happens when I clear my loan? You will be issued with a Redeemed Letter/ certificate of clearance. What happens if I overpay? NSFAF will refund the amount overpaid by debtor. What happens if I die during my repayment process? NSFAF can waive the loan upon request from your next of kin. The request should be in writing and substantiated with a certified copy of the death certificate. What happens if I change employers? If the beneficiary was paying through employer’s deduction, a new arrangement can be made with the new employer for the salary deduction to continue. If the beneficiary was paying through other methods like direct deposit, debit orders and EFT the payment shall continue until the loan is redeemed. Loans are not recoverable after six years. Is it applicable in your case? Loans are recoverable as long as the debtor did not raise a case of prescription. The Prescription Act states 15 years in respect of any debt owed to the state and arising out of an advance or loan of money from the date the loan become payable. Any other loan of money prescribes after 3 years. We encourage the debtor to pay an amount covering a portion of the loan capital and interest charged per month. For example, if the interest charged on an account is NAD 250, we will encourage the person to pay a minimum of NAD 500 towards loan recovery. Does my employer need authority from me to make loan deductions? Yes, your employer can only do deductions with the consent of the employee. My employer stopped deductions from my pay what do I do in this case? Loan repayment is your responsibility. Please keep track of your repayment until completion. When am I eligible to apply for suspensions of loan repayment? When the debtor’s annual earnings fall below a taxable income threshold. When the debtor becomes unemployed. When the debtor becomes incapacitated due to medical conditions. When debtor goes for further studies without an income. NSFAF RECOVERY DIVISION WILL CONTACT YOU REGARDING THE REPAYMENT PROCESS.